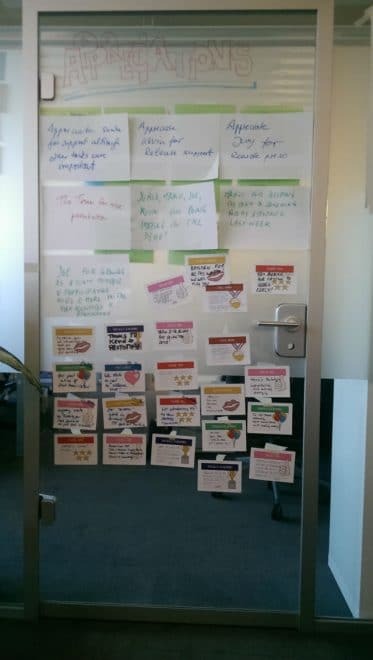 In this blog post, I will explain a very simple exercise: I will explain how to use Kudo Cards in Agile Retrospectives. I believe that what I am going to describe is probably not new for most of you (or at least nothing new in its original format), but nonetheless, I still believe not enough people are using Kudo cards, and for that reason, I want to explain their relevance. In our society, it is quite common to reward people with money for good behavior; I believe this is quite wrong, and I believe there are other and better ways to reward unusual behavior. Through the utilization of this exercise, you can expect team members to feel appreciated by each other. I believe that most of us are so busy with our daily activities that we forget to appreciate what others do for the team or us. The great thing about this exercise is that we do not even need to figure out when is a good time to do this exercise 🙂 The team does this exercise whenever they want. It can be used in sprints where everything went well, or in sprints where everything went wrong. 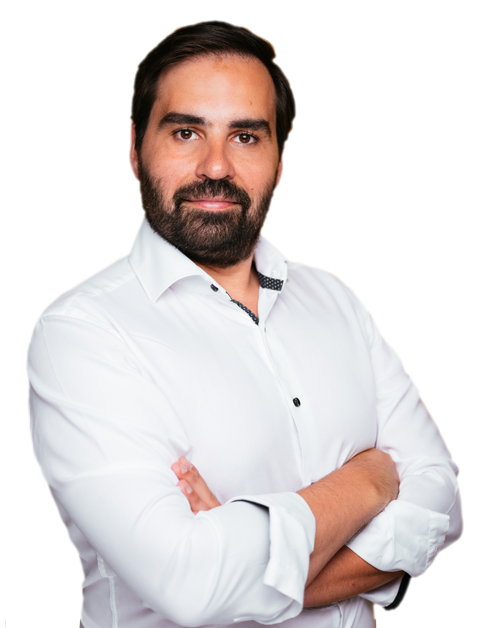 In the first instance, it will serve as an extra boost to the team’s motivation, in the second one, it will act as a reminder that even during difficult times, team members appreciate each other. One of the teams at HolidayCheck (where I am currently working) use this practice every sprint in every retrospective. You can do this exercise at the beginning of the Retrospective as a “Set the Stage” exercise, or at the end of the retrospective, aka the Closing Phase; it’s completely up to the team. As a summary, this exercise can be used every sprint as a way of appreciating good behavior towards colleagues. I believe there is nothing simpler to do than running this kind of exercise :). 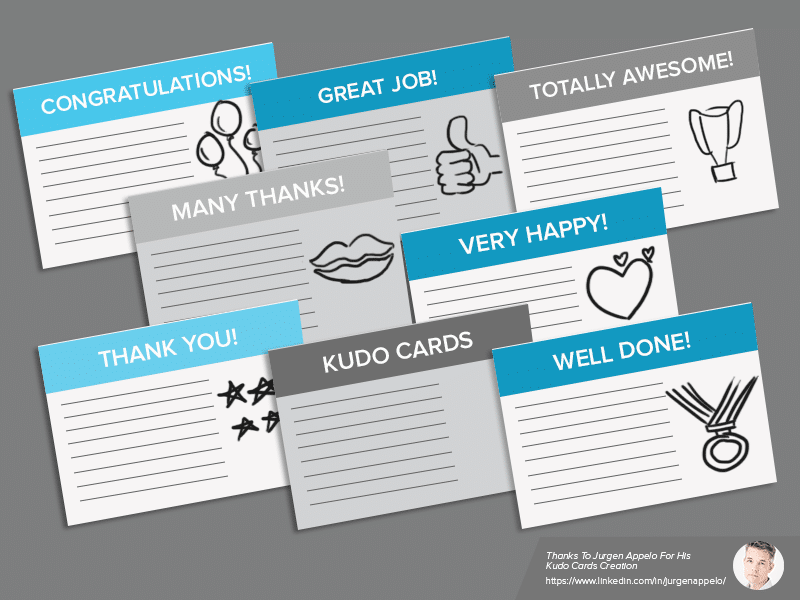 As I said, in the beginning, or at the end of retrospectives (it’s your choice), you deliver kudo cards to people that you want to thank for their behavior during the Sprint. You can create your cards and write what you like on them, or you can only buy Jurgen´s cards at Amazon; download them as the A4 format. Did you like this post? Send me feedback in the comments below. I would love to hear from you! I used Kudo Cards few times in the beginning of the retrospective meetings as “Setting the stage” part (especially useful for Appreciative Inquiry Retrospective, but not only). I noticed how good and different is for the team when we start positive. Everything changes and everybody is willing to speak. For my distributed team, I used Trello and created a template board with Kudo Cards. Then during the meeting we just open this board and everybody starts writing Kudos. Really like the concept. I’ll try it out in my team in the upcoming retrospectives. I think Appreciation Wall is a neat way of boosting the morale of the team. Thanks for sharing the idea, Luis! You say that you do not believe that money is the way to motivate people. Have you read ‘Drive: The Surprising Truth About What Motivates Us’ by Daniel H. Pink? I think this is essential reading for anyone leading or working in a team.